The year’s not over yet! There’s still time in 2015 to help animals in need. Have you made your year-end donation? Gifts received before midnight or postmarked prior to December 31st, 2015 are eligible for a 2015 tax receipt. What better way to end the year by giving the gift of of a second chance? Donate online today. Prefer donating by phone? Our Donor Services team will be standing by from 9:00am - 4:30pm ET, Monday to Friday, to help you with your donations. They can be reached at 1-888-668-7722, ext 321. It’s the purrfect time to adopt during iAdopt for the Holidays. Until December 24th, we have lowered the adoption fee on all cats and kittens to $99 to help find as many felines forever homes before the holidays. The holidays are a great time to come together and add to your family. The Ontario SPCA does not encourage giving pets as a surprise gift and should only occur when the recipient has shown a sustained interest in owning one, and has the ability to care for the pet responsibly. 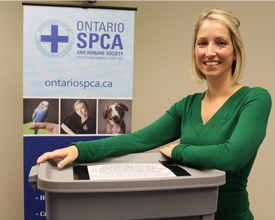 The Ontario SPCA's adoption team is trained to place the animal in their forever home. The Meet Your Match® program, run through our animal centres, is also a crucial element of this discussion. The holiday season is a busy time for many us. Between shopping, decorating and having company over, pets can often feel just as overwhelmed as humans. It’s important to take precautions and keep them feeling safe and away from potential dangers like poinsettias which can be fatal if ingested. There are many things you can do to make the holidays a happy and safe one for everyone. Adorable. Collectible. Charitable. Finally, the Perfect Gift! The Ontario SPCA makes it easy to get the perfect holiday gift for your loved ones. Shopping doesn’t have to be so hard…as long as you can work a keyboard. Watch the video above to see just how easy it is to shop for the animal lover in your life. There's a staggering amount of feral cats in Ontario, and over 100,000 homeless cats will be living on the streets in the GTA this winter. While spaying and neutering your pet is a great start to addressing pet overpopulation, you can also help the feral cats stay warm by building a feral cat shelter for the strays in your community. George & Eclaire are looking for their forever home in time for the holidays. Eclaire is approximately 19 years old, Thoroughbred mare that can be ridden, but for pleasure only. George is approximately 19 years old as well, he’s a Dutch Warm Blood gelding and is broke to ride, however he can only be ridden on flat ground due to some nerve damage in his back (where the saddle is placed). 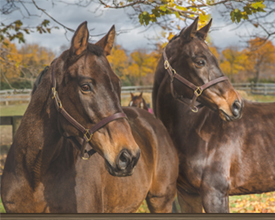 They are both great horses and we would love to find them a home where they can spend their golden years together. Can’t adopt a horse? You can still make an impact by "adopting" Velvet, the horse plush toy. Visit pawsandgive.ca to see her and all her friends. 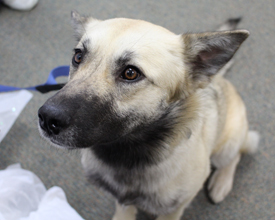 “Keira” was one of the 75 dogs transferred into our care and has been adopted from the Ontario SPCA Provincial Education and Animal Centre by Leah H., an employee working in Spay/Neuter Services. "When she came in for her spay procedure, I instantly fell in love with her, I just knew I had to adopter her," says Leah. Leah already had one dog, an eight-year-old mixed street rescue dog named Bono. The two dogs have become fast friends, and love cuddling with each other. Keira is settling in nicely and she often gets to accompany her new mom to work.